Although Dublin Dr Pepper is no longer available, the use of regular Dr Pepper will provide outstanding results in the preparation of this delicious dish. In a large sauté pan over medium high heat, season short ribs with salt and pepper and sear with vegetable oil, fat side down. After 3 minutes, turn the short ribs over and cook for an additional 3 minutes. Remove the short ribs from the pan and set aside. Add the celery, carrot, and onion to the pan and cook until golden brown, approximately 5 minutes. Add the spices, smoked onion, jalapeño, and tomato and continue to cook for an additional 5 minutes. Add red wine and reduce the liquid by half. Then add Dr. Pepper and reduce by half. Add chicken stock, season and add the short ribs back to the pan. Cover with plastic wrap and foil and place in a 300°F oven for 4 to 5 hours until tender. 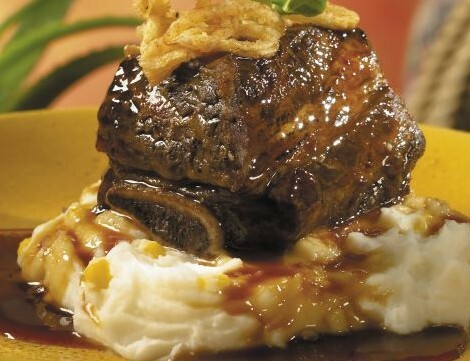 Remove the short ribs from the oven and set aside. Strain the remaining liquid from the pan through a fine mesh strainer and into a medium size sauce pot. Place the sauce pot over medium high heat and reduce liquid by half. Season to taste.